In what has to be one of the larger fits of CO2 Insanity we have the EPA approving 15% ethanol. Why? Well lots of reasons but the shortlist is that it’s a political payoff to their ethanol buddies and farmers who supply them with the crops to make ethanol. Read some more and you probably will get the distinct impression that money has been donated to the Democrats. We also have the EPA staffed with over-ripe greens who will stop at nothing to enforce their vision of how the rest of us should live, no matter how ridiculous it is, and this appears to be plenty ridiculous. While they’re not going to make older cars that can’t handle this mix use it (yet), they will have the newer ones using it, which increases the money their ethanol refinery and farmer buddies will be making, thus the payoff. This also caused me to pause and wonder how they can be talking out of both sides of the EPA mouth. If the EPA gets away with this one, I’ll be they may soon be mandating all cars use this, regardless of age and regardless whether they can handle ethanol or not. If you think not, remember the 1970’s when lead was removed from gas? If you don’t, it wasn’t a problem for newer cars that were designed for it but had issues for older cars designed to run on leaded gas. To educate those not old enough to remember, the older cars didn’t have hardened valve seats that were necessary if you ran unleaded gas. The reason was that the lead deposits actually formed a cushion that prevented valve seat and valve wear. Remove that lead cushion and you have soft metal to metal mechanical problems, such as valves that won’t seal, bent valves, broken valves and holed pistons. Adjustments were made over time, but to you think the EPA gave a hoot if your ’65 GTO blew up because there was no lead in the gas? Nope! So, don’t be surprised if your 1996 car that can’t handle 15% ethanol has problems down the road if they mandate 15% for everything. Think the EPA is going to care? You should also remember the EPA’s last fiasco designed to reduce auto pollution called MTBE. MTBE was supposed to be the big problem solver, but it turned out to be a big problem, period. MTBE, polluted ground water and corroded underground tanks and pipelines. It was eventually deemed to be so nasty they banned it. What’s MTBE? You can go here and read all about it. What’s the cost of removing this government mandated chemical? Oh,” MTBE removal from groundwater and soil contamination in the U.S. is estimated to cost from $1 billion to $30 billion, including removing the compound from aquifers and municipal water supplies and replacing leaky underground oil tanks. There is some controversy centered around the question of who will pay the costs of this remediation.” Nice of the government to mandate something in an alarmist fit that is now costing a fortune. So who’s getting stuck with the tab? Well, the government mandated it, the oil companies complied and put it into their gasoline, and now the government wants to stick them with the cost of removing it. If that doesn’t happen then guess what? The government will pay for it. Either way guess who gets screwed? Either you the gasoline consumer (guess who’s going to raise the price to pay for it), or you the taxpayer (guess whose taxes are going up to pay for it?). Now we seem to be heading towards a new billion dollar plus faux pas by an overeager EPA, who are giving the big payoff and are also bound and determined to get rid of pollution and save us from CO2, regardless of the cost or potential problems. Want to guess who’s going to get screwed in this new deal? It won’t be the government, the EPA, the ethanol producers or the oil companies, it will, as usual, be you the taxpayer or you the consumer. You may as well bend over now in preparation as you will either get stuck by the ethanol industry, the government or both, all in the name of being green. Or, should I say making green? Another reason I’d surmise the rush is that the EPA, farmers and ethanol refiners probably figure the Democrats may not be in power after November, which will greatly reduce their chances of pushing this deal through. Better to get the new screwjob going now and better to make that payoff now in hopes they’ll get some badly needed Democrat votes from the midwest. I have a long list of other issues over this boondoggle. We have the greens and EPA saying we need to do this and the ethanol refiners demanding it. Increasing ethanol production is actually contrary to what the warmers have been saying needs doing to reduce CO2. This is where we get to the talking out of both sides of their big fat EPA mouths. First of all, much ethanol is mostly made from food crops. Corn, Milo, Soy Beans, Sugarcane, beets, etc. It can be made from wood products, but will that get us cutting down more trees at a time when everyone wants us to plant more to offset CO2? It can also be made from Kudzu and perhaps other non-food crops, but that’s not happening much right now. One can wonder if we start planting more Kudzu will it not replace food crops being grown and have the same net effect of reducing food availability. There’s only so much land and they aren’t making anymore, so something will have to give. Remember the constant cries from the warmer crowd about looming major food shortages caused by global warming? Then tell me what sense it is to make more ethanol and use of more food crops that could have been used to alleviate food shortages? Please note that the food shortages are not only caused by lack of food, they’re also caused by price increases. If the demand for corn to make ethanol rises, then what do you think the market’s response will be? It will raise the price of corn and other food crops. When the price of corn is raised, guess what? Poor countries can’t afford to buy grain and we have instant food shortage. It’s already happened in Africa, so don’t think it’s impossible. You can read this at Chemically Green about corn prices going up due to ethanol production. It’s already happening and will only get worse if production is increased. Pure supply and demand. Basic economics 101, something that the Obama administration doesn’t seem to get. Second, we have more crop silliness. If you read much you should have noted that the EPA is now planing on also raising hell about dust created from farms. I don’t know how you’re supposed to plow without making dust, but that’s the latest idiocy. I have to ask, then why make more ethanol, which requires more corn, milo, beets, sugar cane, etc., to be grown, requiring more farming that ultimately will cause more dust? You could use water to keep the dust down, but water is a current and foreseen future problem, too. This is very idiotic indeed. Third, we get into the CO2 emitted from the soil. We have the EPA again complaining about plowing because it releases CO2 into the atmosphere. Yet, they’re totally convinced that CO2 is causing global warming, which is going to cause crop shortages.Why farm more to make more ethanol when all that plowing will create more CO2 that they claim is bad and should be reduced? Also, if global warming is going to cause crop shortages and famines, then do we really want to be diverting good growing land to make ethanol instead of food? Fourth, we are also hearing the constant din about water shortages. Guess what folks? Growing more crops for ethanol will also require more water to be used, so we’ll supposedly reduce car pollution, but we’ll all die of thirst because they’ll use all that precious water up growing crops. As an aside, making ethanol requires huge quantities of water, which exacerbates the situation even more. The more you make the more you use. Einstein couldn’t even get around that one. Fifth, we hear the cries about pollution from fertilizer runoff causing things like dead zones in the oceans, more algae, dead fish and undrinkable water. More farming will increase the use of fertilizer. More fertilizer will runoff into creeks, then streams, then into lakes and bays and create more pollution. Fertilizer that may also get into ground water that is used for drinking. The EPA is against the runoff, but they seem to have made a u-turn and now find it’s perfectly OK if we use more fertilizer to make ethanol. Want to bet what the next $30+ billion dollar cleanup will be and who’s going to get stuck paying for it? It won’t be the government, the ethanol refiners or the farmers it will be the good old taxpayers again via increased prices or increased taxes. Again, like the police say, assume the position. Sixth, ethanol is inefficient to make. You use more energy to make it than it puts out. Kind of like perpetual motion in reverse. According to this article from Organic Consumers it takes 70% more energy to make ethanol than is in it when it’s finished. Again, you have more farming going on to make more crops to make more ethanol. Then you have more trucks transporting the crops to the plant, you have the plant (I’ve been to one I bet they use a lot of power), then you have to ship the ethanol to the refineries, have to truck it to the gas stations. As of now you can’t pipeline it, so is must go via rail or truck. It’s so caustic they don’t keep it in with the gas at the refineries, they add it as the tanker truck leaves. I wonder what it does to those underground tanks and pipes at the gas stations? There are supposedly improvements being made that will reduce the inefficiencies but they won’t happen overnight. Gas mileage? That will drop some because ethanol is about 30% less efficient than gasoline is. I see figures all over the place so you can decide for yourself what the true effect of going from E10 to E15 will be. What I find seems to vary from about <1- to 2+ MPG less with the E15 than with the E10, which already reduced your supposedly about the same vs. straight gasoline with no ethanol. The figures seem to depend on whether the petroleum industry or the ethanol industry is putting them out. Frankly I wouldn’t be surprised if they’re both an exaggeration. Regardless, more gas used = more out the tailpipe and more refining needed to make more because you’re using more. There’s an estimated 144 million cars on the road in the United States, so even if they only lose 1 mile per gallon that’s a lot more gas they’re burning. You will hear that financially, the additional use will be offset by the ethanol reducing the price of gas, but that doesn’t change how much more is being consumed, does it? Engine wear? OK remember this very caustic, cant’ be pipelined or stored with the gas at the refinery. It also absorbs impurities easier than gas and can cause engine problems, not to mention it will also absorb water. Cars with water in the gas don’t generally get very far plus the cost of repairs. Think it’s any better for your engine? Just because it might be cleaner coming out the exhaust pipe doesn’t mean it’s better for your car. If you have a new car that is designed for it, it’s may not be much of a problem. The claim is that 2007 up cars will be OK. As far as the 2001-2006 models, they don’t know because they haven’t completed testing. Have an older car than that? Who knows what it will destroy. If this eventually gets mandated for older cars as I suspicion it will, older car owners may have major problems with things like anything rubber like seals, o-rings, hoses, and perhaps even some aluminum parts like your carburetor (on older cars) the intake manifold and even fuel pump may eventually corrode costing you big bucks. Think the EPA cares? I’d doubt it. I’d assume ways will be developed to get around the problem, but at what cost? I feel this is about the nuttiest thing since Almond Joy Bars were invented. It’s CO2 Insanity rearing its ugly head again, no doubt at the taxpayers expense to solve a non-existent problem and create a lot more problems instead. I guess in the government you call that job security as you always will be around because you create new problems to solve. This sounds to me like it’s probably the closest mankind has ever come to creating perpetual motion. So why all the nuttiness? Well there’s that ultra-classic reason when dealing with industry and government that’s called follow the money. When they say it’s about being green it really means it’s about making green and plenty of it. Why the claim? Well, how about a well-connected retired General in the middle of all of this? Per the Wall Street Journal (WSJ)…….. The cause of boosting ethanol use in cars has been strongly championed by Growth Energy, an ethanol trade group led by Wesley Clark, the retired Army general and 2004 Democratic presidential candidate. Gen. Clark’s group petitioned the Environmental Protection Agency last year to allow ethanol levels in gasoline blends to be as high as 15%, up from the current 10%. So that’s what happened to General Clark after his giant belly flop running for President. Hmmm…..he’s even a Democrat. Coincidence? Nah, there’s money to be made and the Democrats aren’t above making it the old-fashioned way by screwing the taxpayers. Like almost all big industry money it doesn’t just talk, it screams and the government minions hear it loud and clear. Did I hear the word government subsidies echoing in the background? What? Large campaign donations? Huh? Cushy jobs after retirement from government service as delayed payoffs? Yes it sure screams loud! Sounds like General Clark has made his war plans and he’s following through with the initial attack. Corn ethanol subsidies totaled $7.0 billion in 2006 for 4.9 billion gallons of ethanol. That’s $1.45 per gallon of ethanol (and $2.21 per gal of gas replaced). Even with high gas prices in 2006, producing a gallon of ethanol cost 38¢ more than making gasoline with the same energy, so ethanol did need part of that subsidy. But what about the other $1.12. Not needed! So all of that became, $5.4 billion windfall of profits paid to real farmers, corporate farmers, and ethanol makers like multinational ADM. Why is it the farm states put up with this?! 1. 51¢ per gallon federal blenders credit for $2.5 billion = your tax dollars. That’s quite a bit when you figure it only made us 1.1% more energy independent and only reduced US greenhouse gases by 1/19 of 1%. 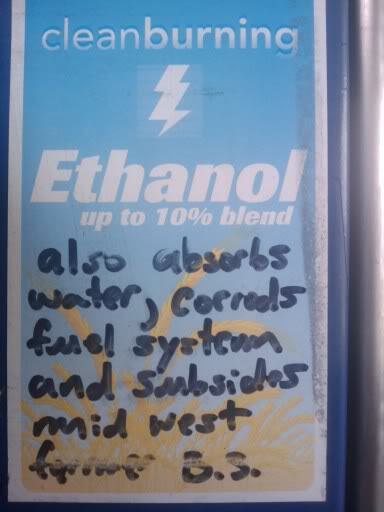 No wonder they want to increase the percentage of ethanol in the gas! Money! Money! Money! Subsidies! Profits! More Subsidies! More profits! A few new Lear Jets , Bently’s and a private vacation island may be looming in the background. Meanwhile, you, the lowly taxpayer, get your hard-earned tax dollars used (again) to make more people rich. What the hell, we already subsidize the solar and wind power, unions, giant pork barrel projects, Presidential vacations every other week and all sorts of other crap like Nancy Pelosi’s $100k bar tab for her big plane she has because the small one was too small for a person of her importance. So what’s a few more billions down the government toilet? Remember the taxpayers always have a lot of money for the government to enrich themselves and their good buddies in private industry. Pass some laws, mete out some subsidies and if it sounds green that’s even better. Why I wouldn’t be surprised if EPA Administrator (administraitor?) Lisa Jackson ends up with a cushy job on the board of directors at Growth Energy after her term is up (which can’t happen too fast!). Want another reason? OK. Remember, we have big-time alarmist in charge at the EPA who appear to know no bounds and are evidently trying to ram through everything on the greentard list at the EPA before the Republicans control Congress or Obama is out of office, whatever comes first. They’re in a frantic mess trying to get as much done as possible, in what may end up being a short period of time, as the November election may be a bloodbath for the Democrats. Remember their last alarmist flop known as “Cash for Clunkers?” That was the Obama administration’s effort to get perfectly good old cars taken off to the car crusher in the name of a) reducing pollution, b) getting people into more fuel-efficient cars (that conveniently can run on E15) and c) trying to jump-start a US auto industry that was in the toilet and about to be flushed. This was a double-screw as it took a lot of perfectly good used cars off the market, which as market’s work, had the effect of raising used car prices and screwing the lower and middle classes who can’t afford new cars and in the current screwed up financial climate, can’t get a loan from the bank because they won’t loan money or want interest rates and terms that the Mafia would be embarrassed over. I don’t know about you , but what a better way to get these older cars they absolutely loathe off the road than dumping E15 they can’t handle into them and basically poisoning them? Put that E15 in your ’68 Camaro SS 396, or your old Ford Mustang and see what happens to it. It may start leaking from numerous hoses and seals, or it may just start to run like crap and then self-destruct. Perhaps slowly or perhaps in one large kaboom as you’re entering the freeway praying that Peterbuilt going 80 in the slow lane doesn’t run you over. At best, with 15% ethanol it’s not going to make as much power or get the mileage it used to, not to mention everyone else’s cars old or new. They may just be salivating at the thought of eventually mandating E15 for ALL cars so that millions of older cars will self-destruct. I’m sure they’re all touchy-feely over the thought of you running out and replacing it with a new Toyota Prius Hybrid or a new Nissan Leaf full electric or some other green vehicle or junked your car and started taking public transit. Depending upon what happens, this may or may not turn out to be big-time CO2 Insanity. I would bet that lawsuits may be flying over this, or that Congress will wake up and stop it before it gets out of hand. We’ll have to wait and see. I’m not taking any bets that they won’t succeed. You can get the rest of the story at the Wall Street Journal link below. It is difficult to imagine how things could get much worse, but then I underestimate the government.